What's it like being a dad?? 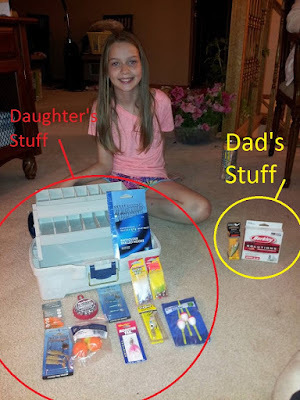 Imagine you are going on a camping / hiking / fishing / GeoCaching trip and you budget a little "tackle fund" to grab some new stuff for yourself. On the day you are going to run to the store, you decide to take along your youngest. Suddenly, you remember that she still doesn't have any fishng tackle of her own, and that you and her mother have been talking about doing so for the past couple of years. Being a dad means that you end up buying yourself the bare minimum from your list, and that the rest is spend on your daughter. Her pile on the left, mine on the right.